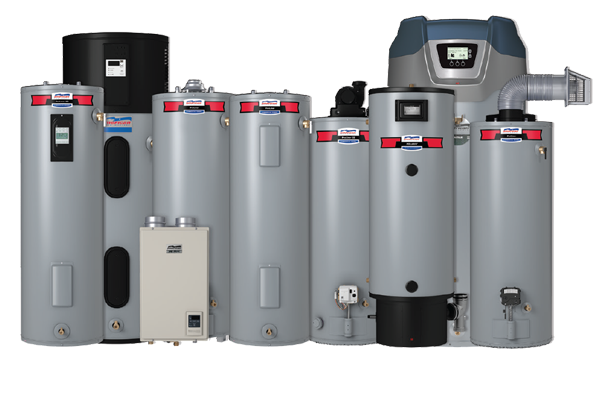 Water Heating Experts LLC is an authorized dealer for American Water Heaters. We install and service all American Water Heaters including tankless, hybrid/heat-pump, electric tank, gas tank, and LP propane tank water heaters. We are the top rated water heater installation company in Palm Beach County. We maintain 5 star ratings on Google, Home Advisor, Angie’s List, and Thumbtack. Water Heating Experts is a licensed and insured plumbing company in the state of Florida. We are an authorized Rheem Dealer for Rheem Water Heaters. Water Heating Experts LLC is owned by Eric Strand, who is a master plumber. Eric decided to focus solely on water heater installation and service. This focus allows us to professionally install your hot water heater quickly, cleanly and up to or above current building code requirements. We install many Rheem hot water heaters and we install the Rheem professional models. These models are superior to the big box home store models. The home store models may use cheaper materials and plastic components. Call us today at 561-602-9062 or text us a photo of your current hot water heater (the installation, and the label on the heater) and we will be happy to quote your water heater replacement over the phone. No pushy sales people, just an honest price, and a professional job. In the past, natural gas hot water heaters were the choice for energy conscious consumers. They were less expensive in terms of monthly energy costs. However, now heat pump electric hot water heaters, also called hybrid hot water heaters, are changing that. 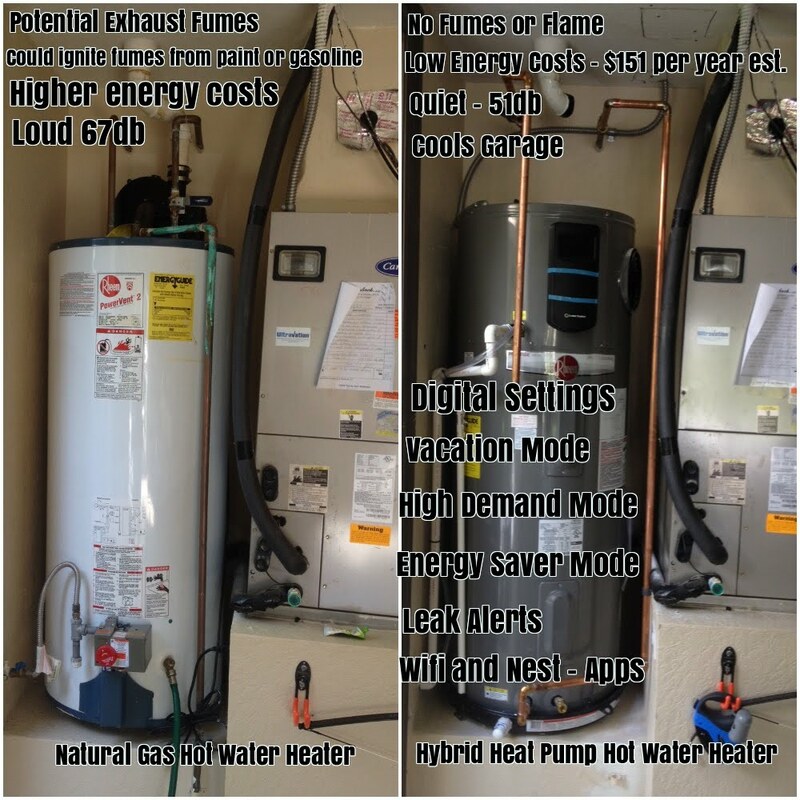 The hybrid hot water heater has several advantages over a gas hot water heater. Quieter – A power vent gas hot water heater is loud when running, sounds like a small jet engine. The Hybrid has a fan that is only 51db about like a refrigerator. A power vent gas is 74 db. No exhaust fumes that exit the unit outside your home. Again, safer and not risk of CO2 poisoning. Not ideal for cold climates – Would require extra ducting to vent cold air outside. Here is an example of a switch from a natual gas power vented hot water heater to an electric hybrid hot water heater. This water heater is installed in Evergrene subdivision Palm Beach Gardens, Florida. The owner is very happy with the switch. They enjoy the little air conditioning boost in their garage and the decrease in sound levels. In this installation we move the old water heater from the attic to the garage. The home owner wanted to paint and remodel his garage but was concerned about the old water heater in the attic. We installed a Rheem 40 gallon electric hot water heater in his garage. Rheem Water Heater with EEmax tankless booster and expansion tank.